Mica’s adaptability and versatility as a natural mineral substance means that it is ideally suited to the manufacture of specialist insulated tooling. Elmelin’s mica manufacturing capabilities mean we can also machine-cut mica shapes and punch mica parts to order. When it comes to specialist tooling, Elmelin provides adaptable solutions. One of our key products in this area is mica tube for heat guns. We also produce non-mica electrical insulation to apply to a wide range of tools, helping to maintain safety standards and protect workers. 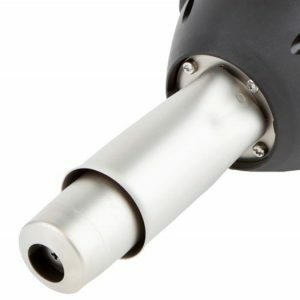 Heat guns are an essential tool in many industries. They are used in engineering, material science and various laboratory and workshop settings. People use them to strip paint, for shrink wrap packaging, to soften adhesives and to thaw out pipes. In short, they have a broad range of functions and come in a variety of models and makes. However, they operate on a common principle. The main part of the heat gun is its heat source, which is most commonly an electrically heated element. It can also be a gas flame. Because it emits concentrated heat, a heat gun requires a high degree of insulation to ensure it will function consistently and safely. This is where mica tube provides an ideal solution. Because of mica’s excellent heat insulation and thermal resistant properties, it can withstand temperatures of up to 1200°C, making it extremely well-suited for heating elements. Mica-based elements in heat guns use ceramic-based mica as an enclosing insulation around the element, which then allows it to emit concentrated heat in a confined space. The enclosing mica tube ensures a uniform distribution of heat – essential for heat guns in a variety of applications and situations. Our mica machined specialist tooling includes customised fixtures and jigs for semi-conductor manufacturing. Machined parts include fixtures for lathes, and for grinding and milling. Other complex machined parts comprise gaskets, washers, flanges, discs and tubes – all essential industrial processing components. Elmelin also manufactures punched mica parts to meet the unique specifications of our clients across a range of industries and sectors. Contact us to discover our wide range of insulation applications for tooling. Safe tools are essential for safe working, and we apply our electrical insulation expertise to a range of tooling products. Our insulation solutions offer a very high standard of live line and electrical protection to ensure both on the job safety and efficiency. The toolkit is integral to how any technician performs their role. Properly insulated tools help keep people safe, and protect against liability due to workplace accidents. Insulation is an essential enabler of processes and day to day working across many industries, whether it’s a production line or an individual requiring protective tools. Elmelin is a manufacturing business focused on delivering innovative electrical and high temperature insulation solutions. Founded in London in 1912, our roots lie in the manufacture of mica insulation products. Today we combine mica with other types of insulation to manufacture client driven innovative solutions. ﻿Which Material is Best for Thermal Insulation? What Qualifies as R&D Cost?